What started out as an April Fools’ joke is now a $99 retro gaming reality. ThinkGeek teamed up with Ion Audio to make iCade real, and they were kind enough to send one our way for review. If you grew up in arcades or know someone who did, you just might be interested enough to click PLAY on the video review above. If not, well, watch anyway and you’ll get a nine minute lesson in what it used to be like to play video games. iCade is a mini-sized arcade cabinet outfitted with a joystick, eight buttons, and a bluetooth radio, not to mention some colorful retro-tastic cabinet artwork. 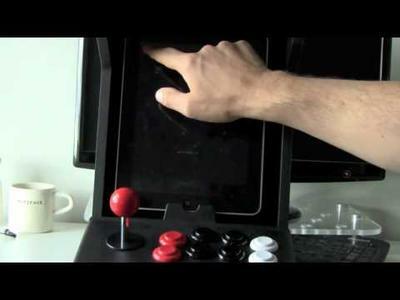 The system is designed to work with Apple’s iPad and iPad 2 tablets; it’s sized to house your tablet front and center where the monitor would go in a “real” arcade cabinet, and the software is engineered to map the controls to Atari’s Greatest Hits app for iOS. 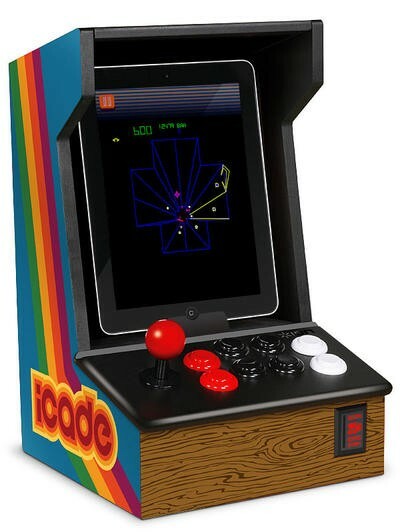 iCade itself sells for $99, which isn’t cheap for a tabletop-sized compressed wood cabinet that requires Ikea-style assembly, but it’s also not priced out of reach for its target audience of 30/40somethings, their kids, and those looking to give them gifts. I wish iCade’s designers had seen fit to include an AC adapter and iPad dock for charging (the unit keeps your tablet in place via a molded plastic holder that looks like a dock connector but offers no functionality), and my review unit suffers from a slight wobble. That said, however, the joystick and eight-button array are pretty much the perfect match for Atari’s old arcade and 2600 console games. Said stick is a little loose, and those buttons are big and loud, but the whole unit feels pretty sturdy, which is definitely a good thing. Us retro gamers tend to be big, strong, emotional types. As for Atari’s app, it’s a bit of a mixed bag. On the one hand, the app is free and comes with one game – I got Missile Command, but the selection apparently rotates over time. Additional games are available via in-app purchases, and cost 99 cents per four-pack or $14.99 for the entire batch of 99 titles. The pricing is pretty great, but Atari was smart about packaging: four-packs generally include one or two arcade titles mixed in with the same/related 2600 console versions. My dad bought our family a 2600 when I was nine and stuck at home for two weeks with pneumonia, so I have a ton of nostalgic love for the console. But the novelty of actually owning and playing those old games wears off pretty quickly in the face of their arcade counterparts. Trust me, it’s those arcade titles that really hold appeal here. 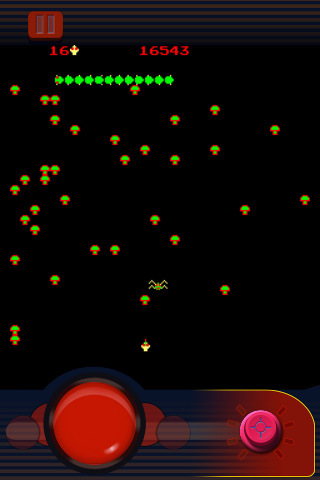 Said arcade titles are faithfully reproduced, though you’ll have to use iCade’s joystick to control games like Centipede and Missile Command that originally featured trackballs. ThinkGeek and Ion are courting game developers to build/port new titles to work with iCade, but as of now Atari’s is the only app that officially supports the system. That said, the latest versions of the iMame4all arcade ROM emulator features integrated iCade support. iMame4all is an app for jailbroken iOS devices and the program itself is not a game, but a system for running game ROMs, so there’s a thicket of ethical and legal issues to wade through before you get to playing Donkey Kong on this thing. At least on the technical side, however, it works pretty well. Which is good, because this thing is just begging for Ms. Pac Man!